I sat and stared at the back of her head for a few minutes, goofy grin plastered on my face. I was partly amused, partly in disbelief over what I’d just heard. My baby girl is talking! Aisha’s road to speech has been slow but sure. Around this time last year, she could tell you her name, and perhaps “hi” and “bye” – with a few blown kisses and a wave for good measure. 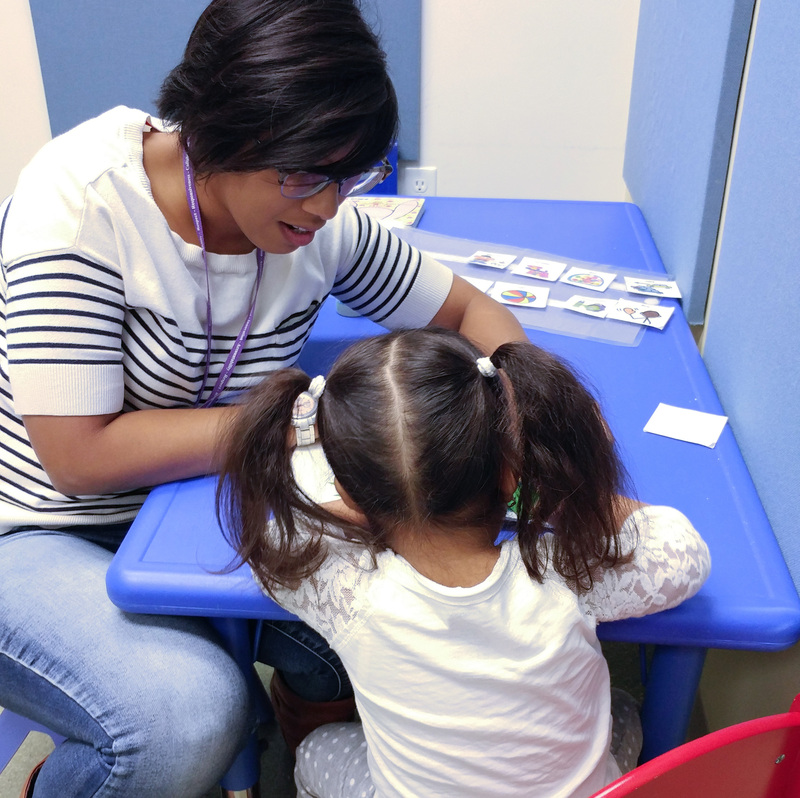 In early November, Aisha started an intensive, eight-week course of Speech Language Pathology with a wonderful therapist named Thanya. We’ve actually had a few quarterly sessions with her in the past, but this year marks the first time that Aisha has had a dedicated block. Prior to starting, the girl had actually attained a few more discernible words/phrases, like “tenjoo” (thank you) “cayuhepeeze” (can you help me, please?) “waddat” (I want that) “dit-dung” (sit down) and “cub” (come). Before we had words, we had signs, but Aisha grew increasingly reluctant to use them once her language started coming in – even if it took us multiple attempts to understand/guess at what it was she was trying to say. The idea behind speech therapy is to introduce and reinforce short-string sentences, sight/word recognition, and build her confidence build her overall confidence in speaking. In addition, we work on following commands and engaging in activities and executing tasks from start until completion. Tanya’s lessons involve toys and a velcro sight words board, where each task and component of the session is moved from the board as it’s started, to a velcro wall while it’s in progress, to the back of the board once complete. The toys range from books to Mr. Potato head, to toys that simulate aspects of home or daycare to toys and activities that prompt Aisha to dictate what happens next through using the appropriate word or sign. While Thanya does provide direction and structure, Aisha leads her sessions through a series of choices – e.g., “Which book would you like to read?” and she has to point to (and sometimes repeat the title of) the book she wants. Other times, she has to choose between toys (difficult for a kid like mine, when every toy is her absolute favourite); in the case of Mr. Potato head, she has to put him together in sequence, or identify which of his parts she’d like to put on (hat, hands, eyes, nose., etc.) During baby-doll play, she has to indicate whether she’d like the baby to eat or drink (signed), “go seep” or get dressed. In the beginning, Aisha would bounce from activity to activity, hardly sitting still for longer that two or three minutes, before her attention was broken by the prospect of MORE TOYS. 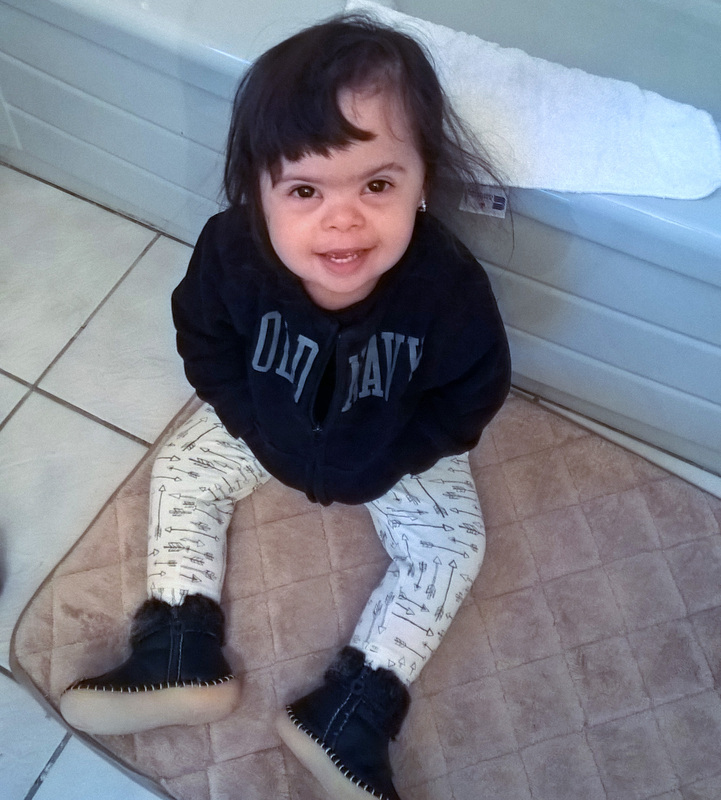 But last week was her second-to-last session, and she sat through two books, chose the things she wanted to play with, indicated clearly when she was done with each (and helped with the clean-up), and asked nicely for the next phase to begin. It’s been fun to see her evolve. Her teachers have noted on several occasions now how Aisha’s communication and interactive skills have blossomed. She’s always been a social kid, but now she’s better able to articulate what she wants (or who she’d like to play with). This evening, after dinner, my mum and I were in the dining room discussing Christmas shopping and the allotment of gifts. During her present run at the mall, she’d scored a few deals for herself (because sales!) and was modelling one of her purchases – a deliciously soft black sweater with a shawl collar and no buttons. We both fell out laughing. I can’t wait to hear what else comes out of this kid’s mouth.